The drum corps world has become wired. From spectators in the stands snapping photos on their digital cameras, to watching live Webcast performances over the DCI Fan Network, the drum corps activity has undergone a technological sea change, and is now a long way from ditto machine recap sheets or dialing a 1-800 phone number to get the most recent scores! One of the latest ways for drum corps fans, parents, members, and even staff to reach out and connect with others in the drum corps community is through the social networking Web site Facebook. Facebook, founded in 2004 by an enterprising young student named Mark Zuckerberg at Harvard University, is a Web site designed to connect friends and acquaintances, with more than 36 million users in the United States and 80 million worldwide. Registration is open to anyone 13 or older, and Facebook has become hugely popular among high school and college students. 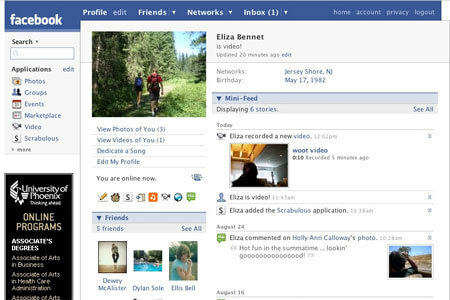 Vying with social networking site MySpace for market share, Facebook is ranked within the top 10 of all Web sites for Internet traffic and among the most popular sites for posting photos. With a demographic rooted in the same age bracket as Drum Corps International, fans have taken to this new Internet utility with the same passion they take to the stands every summer. What a typical Facebook page might look like. For marching members who will soon be headed back to their "normal" lives after the rigors of a seven-week summer tour, Facebook is perfect for keeping in touch with new and old corps friends, even across the country. That's exactly why 21-year-old age-out twin brothers Adam and Stephen Chitta, who play euphonium horn with the Madison Scouts, signed up for it. "I connected when I started college," Stephen explained. "I found myself being asked 'Hey, are you on Facebook?' or 'Add me as a friend on Facebook.' And when I found out how to join, I started adding people immediately and joining groups." "I started using it my freshman year in college," Adam concurred. "Great way to meet new students at school and stay connected with old high school friends." With both brothers on tour this summer, Facebook even served as the medium to conduct the interview for this article, with a message sent by Blackberry phone from the Stanford, Calif. contest to Kalamazoo, Mich. The brothers were able to respond after they finished their performance, making hundreds of miles seem like a click away. Even younger performers are drawn to the online drum corps family. Cecile Aaron Stone, 18, a second-year member with Blue Devils B explained, "I just recently joined and it's a great way to network with people who do the same thing you do. They put up drum corps pictures and talk about their shows. You get to enjoy it from their perspective and see it through their eyes." Fellow Blue Devils B trumpeter Kyle Peterson, 17, is also on board. A six-year member with the Blue Devils organization – one year with Blue Devils C and five years with Blue Devils B – Kyle said, "I get to meet up with drum corps people I've never met before. They see that I'm involved with corps and we get to talk about it." The "DCI - Drum Corps International"
One of the ways drum corps fans can meet up over Facebook is through groups, typically devoted to an idea, organization, or other cause that anyone can join. There are dozens of groups on Facebook for individual corps, many of which boast hundreds of members. Groups range from the functional, organizing alumni or drumming up support for a friend who's marching in a corps, to the fanciful, such as the "Facebook Drum and Bugle Corps" and a group for "lolcorps," humorously captioned drum corps photos in pidgin English. Even Drum Corps International's Field Pass podcast with host Dan Potter has a Facebook fan page. Many groups deal with the very practical need of raising enough money to go on tour. Adam Chitta said, "It's proven to be a great success for fundraising corps dues. Invitations can be sent to school, corps, work and friends for donations. I have gotten from $10 up to $80 [from supporters]. It's very helpful." Not only useful for fundraising, Adam also suggested, "Even if you don't need money, you can create invites for mail and care packages. It's always fun to get mail on the road. Or post your corps' tour calendar which invites people to go see you." Among all the groups devoted to drum corps on Facebook, one stands head and shoulders above the rest as the largest: "DCI - Drum Corps International." It boasts more than 9,200 members, who have uploaded nearly 700 photos, and have discussed drum corps in more than 160 topics on the group message board. The creator of the group is Veronica Lanier, a student in the music education program at Arkansas Tech. Her passion for drum corps started after seeing the PBS broadcast of the World Championship Finals in 1992. A bassoonist and conductor, Lanier said, "The drum corps activity is very special to me, regardless that I have never marched with a corps. It has helped increase my love of music and opened up my eyes to a vast array of teaching methods. Drum corps unites people from different backgrounds. 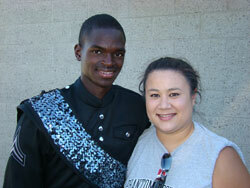 I can only hope to spread my love of drum corps to others." Judging by her involvement through the DCI group on Facebook, she's been successful. Lanier explained the level of attachment young people today have to the social networking Web site. "For many of us, it's almost more common to check Facebook than it is to check our e-mail," Lanier said. "It's another advertising outlet so to speak to get the word out there about drum corps. The DCI Facebook group not only allows current fans to have accessibility to features and links in one place, but it allows new fans a chance to become familiar with the spectacle of drum corps and its fan base." Lanier has put in some hard work trying to keep members involved, and said, "I am actually quite impressed with the group's success, which is due in large part to the actual members of the group who spread the word and invite their friends." The most recent major addition to the group is the inclusion of major DCI events that Facebook users can add themselves as attending and can invite friends to. The page for Allentown has passed 300 confirmed attendees on Facebook, and the World Championships are approaching 3,000. Lanier has also been active updating the group with the latest news items and scores from DCI.org. She even answers questions posted on the discussion boards and less formal "wall." "I've noticed an appreciation among the members of the group when a question is posed and [answered.] Some members of the group may go on to march in a corps or are given a newfound hope because of conversations they have with corps members and alumni in the group. Members of the group who have marched have been really helpful and encouraging and I feel that's a very important part of the future of drum corps – encouraging the younger generations to live out their dreams of marching." Lanier's aspirations include instructing a college ensemble, and to maybe, in her own words, "by some miracle, be on staff with a drum corps." Still, she says that for the time being she's proud to be a fan with a role in bringing drum corps people together with the latest technology. Lanier said, "I know that no matter where life takes me, I'll always follow drum corps because it never ceases to amaze me. I made a promise to myself a few years back that I will attend the World Championships every year until I am physically unable! I am very honored and humbled that DCI took notice in what began as a simple gesture of admiration." Facebookers: Check out these drum corps related pages: DCI – Drum Corps International 2008 Drum Corps International World Championships event page. Big, Loud & Live 5 event page. "Field Pass" with Dan Potter Facebook fan page. Not on Facebook? Get registered now at Facebook.com.